Yekaterinburg is the administrative center of the Sverdlovsk Oblast and with around 1.3 million inhabitants it is the third largest city in Russia, after Moscow and St. Petersburg. Formerly known as Sverdlovsk (1924-1991), it is the main center in the federal district of the Urals Region. Ekaterinburg Museum of Fine Arts, Voevodina str (Just south of the Goroskoy Prud, on the west bank of the river). Some fine works by Russian 18th and 19th century artists, minor artists of the 16th to 18th Century European Schools and some lovely small sculptures and jewelry. RUB50. Yekaterinburg has a continental climate with long, cold winters and relatively warm summers. From June to August, average daytime temperatures are in the 21-24 °C with nights in the 11-14 °C range. Winters from December to February are cold with days between -7 °C and -10 °C and nights averaging -14 °C to -17 °C. The alltime high and low stand at 39 °C and -47 °C respectively! Almost half of the annual 420mm of precipitation falls during the summer months, while snow is common in winter. Koltsovo Airport (SVX) offers a wide range of flights, with destinations like Moscow, St. Petersburg, Minsk, Frankfurt, Helsinki, Dubai, Rostov-on-Don, Novosibirsk]], Yerevan, Tomsk, Volgograd, Beijing, Astana, Dushanbe, Baku, Istanbul, Almaty, Barcelona, Irkutsk, Khabarovsk, Krasnodar, Krasnoyarsk, Munich, Rome, Prague, Sanya, Samara, Simferopol, Sochi, Sofia, Tel Aviv, Ulan Bator, Vienna, Vladivostok, Tashkent, Nizhny Novgorod, and several seasonal/charter flights to Hurghada, Antalya, Tianjin, Bangkok, Phuket, Sharm el-Sheikh, Burgas, Heraklion, Larnaca, Pula, Thessaloniki and Varna. Yekaterinburg is a major station along the Trans-Siberian Railway, with regular trains in all directions. Moscow is about 26 hours away, Omsk 12 hours and Novosibirsk 20 hours. Yekaterinburg has 1 underground metro line, connecting the city centre (stop is near the Circus) to Uralmash - a large industrial and residential area, with a stop near the main railway station. The metro is popular with locals because it is quick and inexpensive, costing RUB23 per ride. The stations are impressive, decorated with native Ural stones, granite and marble. All stations are open between 6:00 and 24:00. Train frequency on weekdays in rush hour is 4-5 minutes; all other times and weekends it is 8-11 minutes. During recent years many new cafés and restaurants have opened in Yekaterinburg, providing the usual mix of Russian/Japanese and Italian food; unfortunately the level of international cuisine is not that high. You can pay hourly rates at the resting rooms (Komnaty Otdykha) at the main train station. To get there, walk to the eastern end of the station to the last and small set of glass doors. First door on the right should lead you to a set of stairs which will take you there. 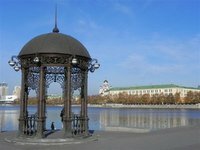 We have a comprehensive list of accommodation in Yekaterinburg searchable right here on Travellerspoint. You can use our map to quickly compare budget, mid-range or top of the range accommodation in Yekaterinburg and areas nearby. This is version 11. Last edited at 8:34 on Oct 27, 17 by Utrecht. 27 articles link to this page.